Do you have a need new computers for your school, or maybe a playground that needs fixing up? Do you know someone under 35 making a difference in the lives of students in your community? If so BET and the Box Tops for Education® program have joined forces to reward every day members in the community making an extraordinary impact in the lives of K-8 students, and we need your help. 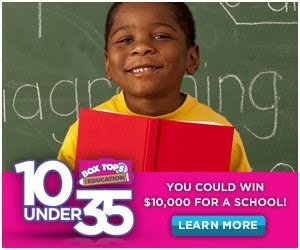 Honor your unsung community hero with a nomination for the Box Tops for Education® 10 under 35 contest and YOU have the chance to earn $10,000 for your school, $1,000 for yourself and an all-expense paid trip to the Box Tops for Education Town Hall in Atlanta! It’s simple, if you’re an educator making a difference in the lives of students K-8, have someone nominate you for the 10 Under 35 contest.You can tell us how they’re making a difference in their school and their community. BET and Box Tops will select ten finalists and starting October 24th you’ll have the chance to use your social media clout. Rally your friends and their friends to rack up your vote!